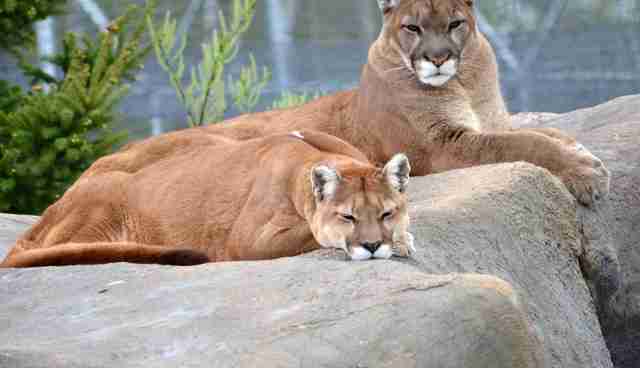 Liberty, a 14-year-old cougar who lives at the Wildcat Sanctuary in Minnesota, has lost the majority of her eyesight - but she has one constant in her life to keep her company. 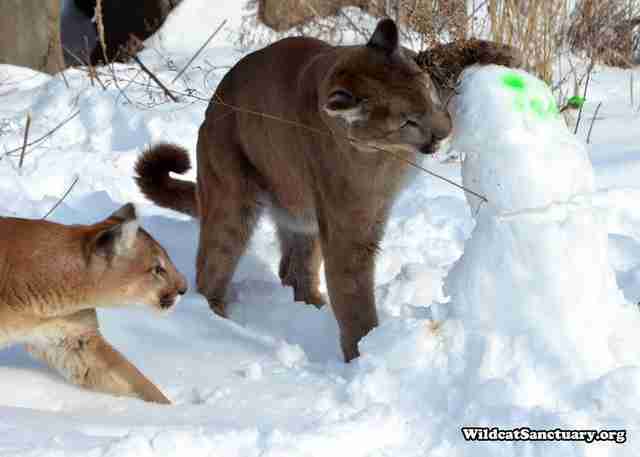 Raja, along with another cougar named Tasha, came to the sanctuary in 2007 - they had both been kept as house pets by their previous owner. Liberty, who is one of the sanctuary's worse abuse cases, was rescued and joined them a year later. She was extremely emaciated and dehydrated when she first arrived, and had untreated fractures in both of her back legs. "The tops of her ears were dangling by a small amount of flesh and were about to fall off," according to a blog post by the sanctuary. 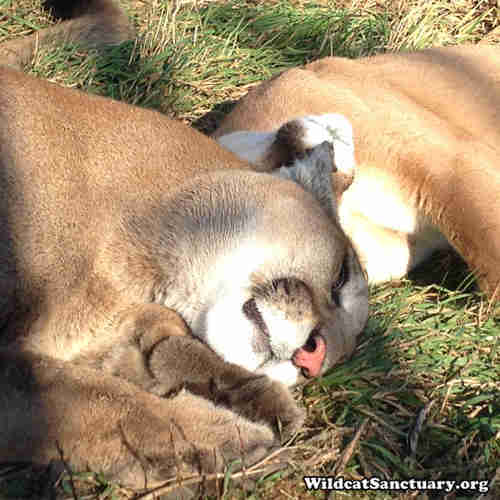 Eventually, Liberty was able to recover thanks to the care of the sanctuary's staff. She also gained a partner for life. "Years ago, Raja and Liberty were in separate [enclosures] near each other [at the sanctuary]," Julie Hanan, sanctuary spokesperson, told The Dodo. "Liberty would vocalize to Raja all the time." The two were different sizes, had different personalities (with Raja being the shyer of the two) and were of different ages - Raja is currently 10 years old - but there still seemed to be potential for a spark. The sanctuary tested out a playdate between the two. From there, they became friends pretty fast. "They haven't had one spat since the day they were introduced," Hanan said. "It was another great match we made after careful observation of personality types." 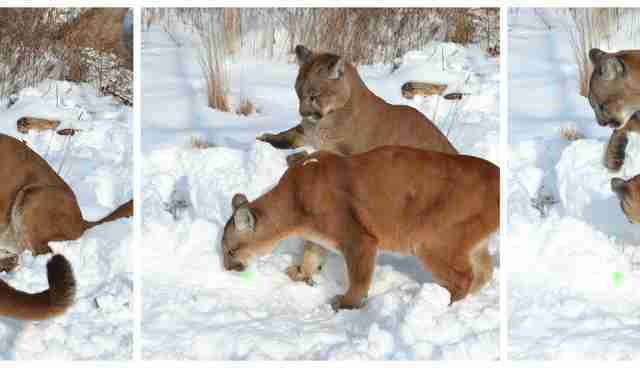 The two have been together ever since and nothing's affected their powerful bond, not even the onset of Liberty's blindness, which the sanctuary suspects is due to the poor diet fed to her when she was young. Not only does Raja help support Liberty, but Liberty's bold personality helps Raja be a little braver as well. "Even with failing eyesight and all she endured with her former owner, she'll be the first to make her way over to check out who's come to see them," Hanan said. "[She gives] Raja the confidence he needs to slink over low in the grass, hiding along the way." It's hard to think of a better team than these two enduring friends. 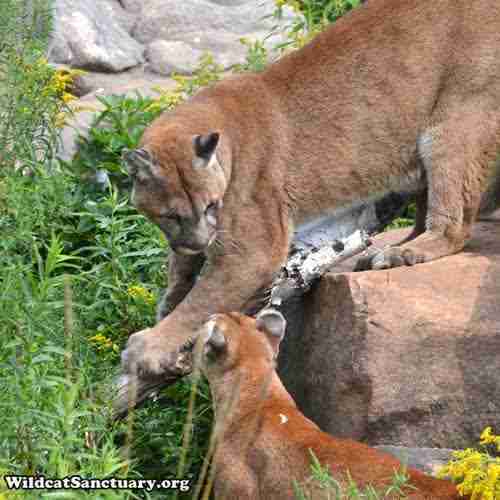 Want to help the Wildcat Sanctuary continue doing good work? Here are all the ways you can help support them.